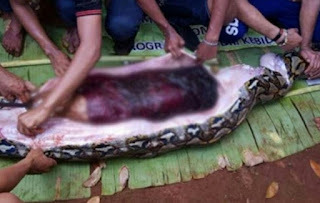 A woman who was missing and subjected villagers into desperate search of her was later discovered to have been crushed and swallowed by a giant python after its belly was cut opened. 54-year-old Wa Tiba went missing while tending to her vegetable garden near her village on Muna Island in Southeast Sulawesi province in Indonesia on Thursday, according to the village chief, Faris. When her family went to look for her, they found only her belongings in the farm, including her sandals, a machete and a flashlight. The villagers subsequently launched a search for her but were horrified to find a 23-foot-long python with a severely bloated belly just 50 yards from the garden. Faris said the villagers killed the snake and when they cut open its belly, they found the woman’s body still intact wearing all her clothes. Local police chief Hamka, who only has one name like many Indonesians, said: “Residents were suspicious the snake swallowed the victim, so they killed it, then carried it out of the garden.